Following a Low Sodium Diet Can Be Delicious! 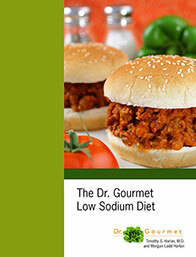 With The Dr. Gourmet Low Sodium Diet, you'll find that reducing your salt intake doesn't have to mean bland, boring food. I was told to go on a low salt diet. Are the salt substitutes a good alternative, or are they just as bad for you? I feel that the best way for you to lower your sodium is to learn about the amount of sodium that is in foods that you eat. More importantly, keep in mind that a teaspoon of salt has about 2300 mg of sodium. This is about the amount that you need each day. Remember this and use the salt carefully, adding up the amount of sodium in a dish. In a study performed in 1982, a group was placed a low sodium diets for five months. Their taste response to salt in solutions, soups, and crackers were measured before the diet and while they were on the diet: a 5-month period when subjects lowered their sodium intake. The same measurement were made in a control group that did not change their diet. In the group that lowered their sodium intake, the perceived intensity of salt in crackers increased and amount of salt needed for "maximum pleasantness" of taste in soup and crackers fell in the experimental group but not in the control group. It is clear that preferred levels of salt in food is dependent on how much salt you consume over time. So if you just give it some time and slowly decrease the amount of salt in foods you prepare, your perceptions of saltiness will change.